Materials used in the construction of Burkert Solenoid Valves are carefully chosen to help ensure chemical compatibility with the media you intend to use in your process application. 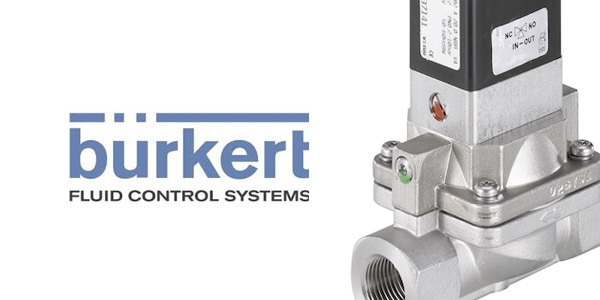 Chemical resistance is crucial to system designers, engineers and installers; especially when dealing with aggressive fluids and the fact that Burkert Solenoid Valves can be found in many different sectors. These include: water supply, waste water treatment, machine and plant engineering, building services, safety engineering, compressors, fuel supply, firing systems, gas chromatography, blood analysis instruments, sterilisers, general process engineering, textile industry, domestic installations, biogas plants, car washes, rail, motor and shipbuilding. Take a closer look at the table below which gives you a brief insight into the chemical resistance properties relating to gasket and housing materials used in the construction of Burkert Soelnoid Valves. PA Polyamide Resistant to grease, oils, waxes, fuels, weak bases, alpatic and aromatic hydrocarbons. EP Epoxy Resistant to nearly all chemicals. Not resistant to low-molecular organic acids in high concentrations and highly oxidising substances. 1.4305, 1.4401, 1.4581 Stainless Steel Resistant to light acids and caustic solutions. PVC, PVC-HT Polyvinyl Chloride (hard) Resistant to most acids, caustic and saline solutions. PP, PE Polypropylene, Polyethylene Resistant to many organic solvents, aqueous solutions of acids, bases and salts. PTFE Polytetrafluorethylene Resistant to nearly all chemicals. Not resistant to liquid sodium and flurides. PPS Polythenylsulfide Resistant to aqueous mineral acids, bases, aliphatic and aromatic hydrocarbons, many ketones, alchols, halogenated hydrocarbons, oils, greases, water and hydrolysis. PEEK Polyetheretherketone Resistant to most chemicals. Not resistant to concentrated sulphuric and nitric acid and certain halogenated hydrocarbons. PTFE* Polytetrafluorethylene Resistant to nearly all chemicals. Not resistant to liquid sodium and fluorides. EPDM Ethylene Propylen Diene Rubber Resistant to ozone and hot water. Not oil and grease resistant. FKM Fluorocarbon Rubber Resistant to oil and many chemicals, as well as heat. NBR Nitrate Rubber Resistant to oil. FFKM Perfluorinated Elastomers Resistant to extreme heat, weather and most chemicals. For further information download Burkert's Chemical Resistance Chart here. When selecting your Burkert Soleniod Valve remember to check the accompanying technical datasheet where you'll find detailed specifications on the valve, it's intended use and the gasket and housing materials used. Refer to the Burkert Chemical Resistance Chart if you're unsure or call our technical team at Valves Online on +44(0)1822 855600 or +44(0)161 480 5700. Don't forget... you can find and order your Burkert Solenoid Valves here or at www.solenoidselect.co.uk, part of Valves Online.